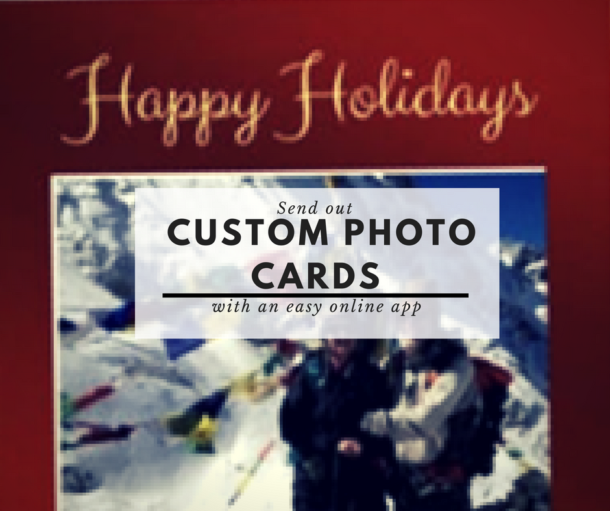 Have you ever wish you could send photo Christmas cards personalized for everyone on your list? Well, guess what? There’s an app for that! It’s easy. It’s affordable! And it even stuffs and mails the cards for you. What could be easier? Last year I wrote about using Avery labels to make addressing your Christmas cards easier. Since then, I’ve discovered the SendOutCards app. I’ve been using it for about 6 months now, for both personal and business greeting cards. And I have to say, I am a huge fan of this product. What’s so great about it? Well, so many things, I almost don’t know where to start. I love the convenience of these online cards. I just sent out all of my personal and business Christmas cards, and I didn’t need to create labels, or lick envelopes, or even go to the post office for stamps. I did everything from the comfort of home beside a warm and cozy fireplace. I also have the app on my phone, so I can send out a greeting card whenever I think about it – when I’ve just finished a session with a client or I’ve met someone new that I want to stay in touch with. Or just because I was thinking of someone. For my personal Christmas cards, I went with a completely custom 3-panel card that replaced my usual Christmas letter. It was full of photos and stories from the year, And if I do say so myself, it looks quite professional. For my business, I chose a standard Christmas card and created my own personal message inside. I used what they call a ‘campaign’, so that I could personalize each card with the name of the person (or persons) I was sending to. I’ve also purchased the options to use my own handwriting and signatures, so these cards have a very personal and custom feel to them. This app has more than just Christmas cards. They have thousands of cards to choose from for just about any occasion. Or you can start a card with any one of your photos on the front and create your own message inside. It’s super simple. If you have more time and you feel like being creative, there are lots of templates and embellishments to make it truly unique. The amount of customization you do is totally up to you. The price is unbelievable! The app is US based, so I’m paying US prices. But even with a horrible exchange rate (currently $1.33 Cdn for $1 US), I’m paying about $2.06 Cdn per card, including the postage! That’s for a truly custom card, stuffed and mailed. (Prices vary depending on the size of card and where it is being sent.) I don’t think you can even buy a generic card for that any more, except maybe at the Dollar Store. If you have a business, you can include your own personalized branding on the back of every card. And you can change it up for different campaigns. So if you have multiple businesses, or multiple marketing campaigns, it’s no problem. It’s completely flexible. I uploaded my address list, and included birthdays and anniversaries for those special folks on my list. I get an email reminder about these events, so I can remember to send a card. No more missed occasions. I can’t believe I haven’t mentioned the gifts yet. For an additional cost, there are a range of gifts you can send along with your customized card. Whether it’s a gourmet treat, an inspiring book, or something for baby, there are a host of ways to make an impression on someone. Ok, I admit, I have gotten very creative and sent some spectacular cards with ‘vintage’ photos of friends and family. They are a HUGE hit! But even if you feel you’re not creative, you can send any photo you have on your phone or computer. It doesn’t have to be a golden oldie. You can even snag one from Facebook. And guess what? In this digital age, some kids have never seen a photo of themselves printed out before. They are blown away to get a card with their photo on it. So, if you haven’t sent your holiday Christmas cards yet, what are you waiting for. Check out the SendOutCards app, and send a card on me to try it out. And then, let me know what you think of it.